Black Marlin, usually confused with the Blue Marlin because of their similarities in appearance, are members of the billfish family because of the long bills on the front of their faces. They have long, slender bodies with prominent pectoral fins. These fins don’t fold against their bodies like most pectoral fins, so they remain erect at all times. Some Black Marlin are dark blue in color, while others have black upper bodies, but all Black Marlin have a silver/white color on their bellies. They have a distinct face with very small teeth and upper jaws that flow out into a beak or spear-looking nose. Black Marlins are members of a group of fish known as the “Billfish Family.” This is a large group of surface water fish that live and feed around the tropics. 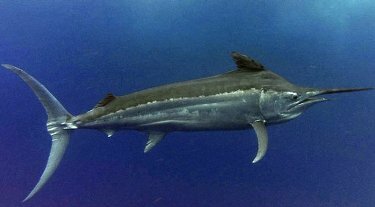 The Black Marlin is scientifically known as Makaira Indica, and lives around tropical areas in the Pacific and Indian Oceans. They tend to be open water fish and are usually found near islands. They can be seen on occasion jumping straight out of the water, though most people don’t get close enough to witness that. Most Marlins prefer warm water temperatures between 21 degrees and 28 degrees Celsius, and are rarely found in north Atlantic waters. Most Black Marlin are found in waters around 300 feet deep, though some to travel further. Their location is based on food, as they usually don‘t have to worry about predators. Females are the largest members of the species and can grow up to 300 pounds. Males of that size are rare, and most are around half that weight. A female black marlin is capable of holding up to 40 million eggs, and they are fertilized externally in waters around 27 degrees Celsius. Fishing for Black Marlin is not recommended and shouldn’t be attempted by amateurs. 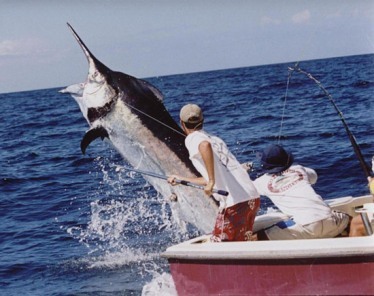 There largest Black Marlin ever found on record was a remarkable 1500 pounds. They can reach a maximum length of 15 feet, but most are about half that size. They use their bills as a hunting tool to stun their prey. They feed on the fish after they knock them unconscious so they don’t have to chase them down. Their favorite food is tuna, though they eat smaller fish. Fishing for Black Marlin is not recommended and shouldn’t be attempted by amateurs. It is a dangerous task that could lead to injury. Their long jaws and violent behavior make them prized, but also make them dangerous. The most popular fishing technique is trolling with large bait. The best bait to use is whole fish or squid. Anglers will need to have a strong rod and line to withstand the power of the Black Marlin. Many Black Marlin are caught by accident while reeling in other fish, but most aren’t boated due to the lighter tackle.